After a small vacation related to the iPad Mini rumours, the rumour mills are back to work and this time around news coming in suggests that Apple is indeed working on a smaller version of its iPad. According to sources close to Bloomberg, the tablet would arrive in a size of about 7 to 8 inch diagonally and would be launched in October this year. 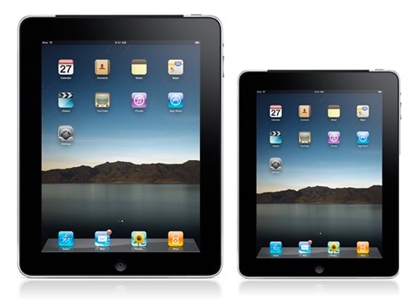 The sources have indicated that the only reason that Apple wants to launch an iPad Mini is to help “maintain dominance of the tablet market as Google Inc. and Microsoft Corp. prepare competing handheld devices.” The sole purpose is to compete with the likes of Amazon’s Kindle Fire and Google’s recently launched Nexus 7. We have heard earlier that the Mini would arrive with a 7.85 inch screen so the latest ‘between7 – 8 inch’ saying is corresponding to old rumours. The source has also indicated that the screen resolution of the iPad Mini would be lower than the iPad which arrives with Retina Display. Also the price tag that Apple wishes for the smaller iPad is expected to stay at $199, just to take over Nexus 7 and Kindle Fire. Also the October launch is keeping in view to gain the maximum buyers as it nears the holiday rush sales. We hope more rumours and leaks to follow in the next few months as we near the October launch period.